UNITED NATIONS (AP) — North Korea needs more trust in the U.S. and their developing relationship before it will get rid of its nuclear weapons, Pyongyang’s top diplomat said Saturday as an envoy from another of the international community’s biggest worries — Syria — demanded that the U.S., France and Turkey withdraw their troops from his civil-war-wracked country. 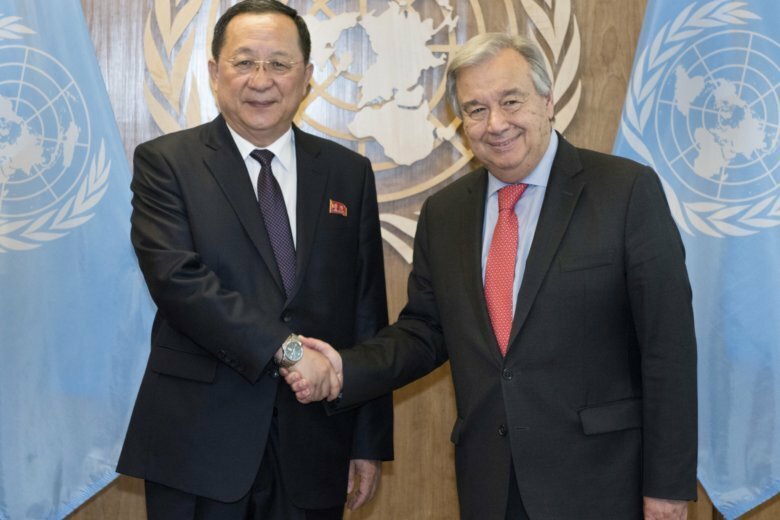 More than three months after a June summit in Singapore between the U.S. and North Korean leaders, Ri Yong Ho told world leaders at the U.N. General Assembly that the North doesn’t see a “corresponding response” from the U.S. to North Korea’s early disarmament moves. Instead, he noted, the U.S. is continuing sanctions aimed at keeping up pressure. “The perception that sanctions can bring us on our knees is a pipe dream of the people who are ignorant of us,” he said, adding that the continued sanctions are “deepening our mistrust” and deadlocking the current diplomacy. “Without any trust in the U.S., there will be no confidence in our national security, and under such circumstances there is no way we will unilaterally disarm ourselves first,” Ri said, adding that the North’s commitment to disarming is “solid and firm,” but that trust is crucial. Washington is wary of easing sanctions or agreeing to another of the North’s priorities — a declaration ending the Korean War — without Pyongyang first making significant disarmament moves. Officials at the United States’ U.N. mission didn’t immediately respond to an inquiry about Ri’s comments, which came as U.S. President Donald Trump and his secretary of state, Mike Pompeo, are trying to regain momentum in their quest to get North Korea to renounce its nuclear ambitions. Pompeo is planning to visit Pyongyang next month to prepare for a second Kim-Trump summit. Both Kim and Trump want to meet again. But there is widespread skepticism that Pyongyang is serious about renouncing an arsenal that the country likely sees as the only way to guarantee its safety. Pompeo and Ri met on the sidelines of the General Assembly Wednesday for what Pompeo described as a “very positive” discussion. He did not give any details. The North has traditionally said that the nuclear standoff is between it and the United States, but recent summits between Kim and South Korean President Moon Jae-in have also dealt with the nuclear issue. Like North Korea, Syria could be on the cusp of significant developments. Syrian Foreign Minister Walid al-Moallem declared Saturday that his country’s “battle against terrorism is almost over” after more than seven years of civil war. He demanded that U.S., French and Turkish troops pull out of the country immediately, calling them “occupation forces” that are there illegally, without the government’s invitation. The U.S., French and Turkish U.N. missions didn’t immediately respond to inquiries about al-Moallem’s speech. Al-Moallem vehemently restated denials that Damascus has used chemical weapons during the war — although international investigators have found otherwise — and he called on all refugees to return home, saying that is a priority for Damascus. Syrian government forces, backed by Russia and Iran, have retaken most of the territory rebels seized during the war that has killed over 400,000 people and driven millions from their homes. A military offensive by President Bashar Assad’s forces on Idlib, the last remaining rebel stronghold, was averted last week in a deal reached between Russia and Turkey to set up a demilitarized zone around the province. Still, there is uncertainty over how the deal will be implemented; two insurgent groups have rejected it. Idlib has been a relative refuge for people displaced by violence in other parts of the country, and U.N. Secretary-General Antonio Guterres has said a full-scale battle for Idlib could unleash “a humanitarian nightmare” surpassing the misery already seen during the war. Al-Moallem said the Syrian government hopes that when the demilitarization zone deal is implemented, “the last remnants of terrorism in Syria” will be eradicated. Investigators from the U.N. and an international chemical weapons watchdog have attributed several chemical attacks during the war to government forces, while also blaming the Islamic State extremist group for at least one chemical assault. Syria has denied using chemical weapons in the fight. “We fully condemn the use of chemical weapons under any circumstances,” al-Moallem said. He said countries have lobbed “ready-made accusations” at Syria without evidence. The issue has been a flashpoint at the U.N. Security Council, with the U.S. and Western countries denouncing Assad over chemical attacks and Russia rejecting the investigators’ findings. The U.S. has twice carried out its own airstrikes in response to the chemical attacks. Hours later, Pakistani Foreign Minister Shah Mahmood Qureshi retorted that India “preferred politics over peace.” India had called off a meeting between the two ministers on the assembly sidelines this week after an Indian border guard was killed in the disputed region of Kashmir. Meanwhile, Canada postponed its scheduled speech Saturday amid high-stakes trade talks with the U.S.
Associated Press writers Maria Sanminiatelli at the United Nations and Rob Gillies in Toronto contributed to this report.